The JUGS Cricket machine offers the batsman and fielder many great benefits during training and practice. The JUGS cricket bowling machine is a serious training tool with enormous adjustability, high quality construction and amazing reliability - which is why it is supplied with a 5 year warranty. The machine can be slowed down for beginners or increased up to speeds to challenge the highest level players. It's portable and and simple to set up. 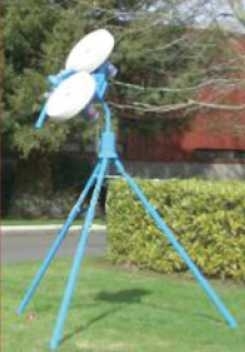 Has adjustable legs to allow releases at different heights. Uses special non-marking pnuematic tyres which last for many years. Simulates both left and right-handed bowlers. 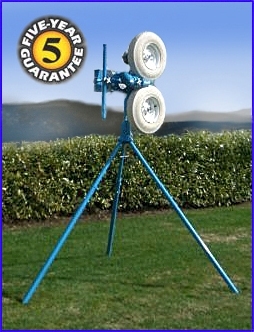 Swivel-design base casting provides 360 degrees movement for a variety of fielding drills. Powered from 220V mains outlet or can be powered from an inverter type petrol generator. The Jugs cricket bowling machine can use Jugs dimpled practice balls - specially designed for stable flight - either the extra hard type with a playing feel similar to a regular cricket ball, or the "sting-free" type which have a softer surface. It can also bowl genuine match or practice cricket balls. 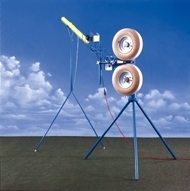 An automatic ball feeder is also available for the JUGS Cricket Bowling machine. Priced at £410 inclusive. Price includes VAT, UK mainland delivery and 5 year warranty. Contact us for details of delivery times or if you have any other questions. Unit 1, Micklefield Green Farm, 7 Sarratt Road, Rickmansworth, Herts.